Having previously bought Etude House’s eyeshadow palette, I was convinced to buy its new launch this year as well. I have yellow/red undertones, therefore warm colours like pink and mauve would be a nice fit for me. The pink colours look gorgeous, and I personally really like the glitter shades more than the matte ones. If you do a quick Google search of this palette, you see really good swatches. I have no idea how those bloggers did it because I sure had a hard time with this. As I mentioned previously, the one gripe I have with Etude House’s eyeshadows is its poor colour payoff. It took me a few swipes to get each colour swatch, and the lighter colours look almost nonexistent on my skin. Nonetheless, I really like the colours in this palette. My go-to colours for a natural look are The End of Spring, Cherry Blossom Rain, and Sweet Jujube Tea. The muted colours help in softening your eye look, especially if your eyeliner game is strong. 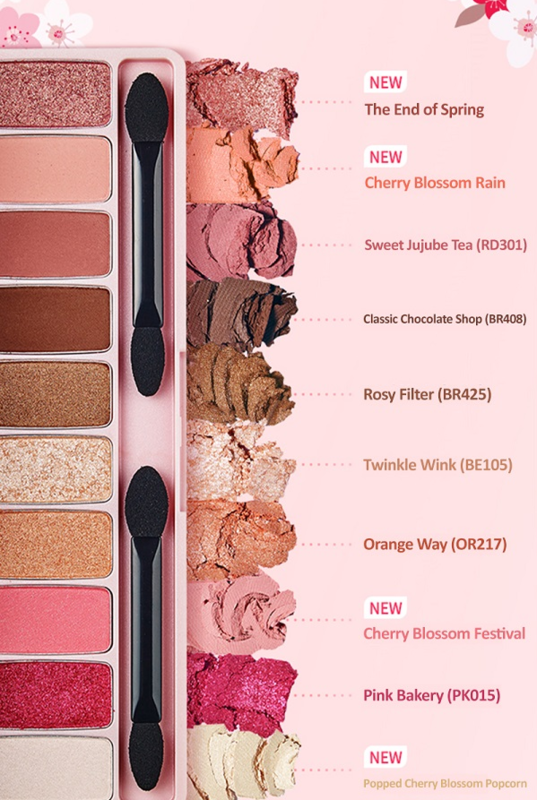 When I want to go for a stronger look with more emphasis on the eyes, I’d go for Cherry Blossom Festival and Pink Bakery. Popped Cherry Blossom Popcorn, the white glitter shade, is also a good substitute for white eyeliner, and I sometimes use it to draw my waterline. For its price, I’d say this palette is definitely a steal. However, as with most of Etude House’s eyeshadows, I still lament about the poor colour payoff and its durability. The colours are so gorgeous – it’s such a waste that they’re not coming off as strong and nicely as they should. I love Etude House but the color payoff is a huge drawback for me too! I love ur site btw!